Ok, I know I said we weren't getting any baby chicks this spring. And, technically, I'm correct. We did not buy any new chicks. But it turns out our partridge cochin, Hoppy, did have plans for baby chicks and with a little assistance, she got them. So, here's what happened...Hoppy went broody. This is nothing new since she's a cochin; she's always broody. No big deal. Except this year we have Roopert, our unexpected buff orpington rooster. Then enter into the picture my husband who has always wanted to have Hoppy hatch her own chicks. So, as Hoppy patiently sat in her nest box, my husband took two eggs he thought were fertilized and put them under her. He marked them to keep track of them. Every morning he's been letting the chickens out and then closing them up at night. He knew how many days this would take. I didn't give this whole thing much thought and went about my business until yesterday morning. My husband came into the house and asked me to hold out my hand and close my eyes. I don't like this trick, so I refused. He didn't need the trick though, because some little peeps echoed from his pocket. So, there you have it! Two baby chicks hatched sometime in the wee hours of May 13th. A late Mother's Day gift! With the news, I quickly set up our "chicken hospital" with bedding and a new nest box for Hoppy. I knew we had to move Hoppy and her chicks out of the main coop. There's just not enough protection and we've got lots of predators; cats, snakes, raccoons, a dog. Plus, we're having yard work done. Hoppy easily settled into her new coop in the garage and, for the most part, kept the babies under her until my kids came home from school. Then, Hoppy couldn't wait any longer. She moved over to the food and water and the two chicks came with her. She showed them how to eat and drink and they had a great time trying out their new nibbles. Hoppy patiently let us hold the chicks and then tucked them back under her belly for a little TLC. This morning the chicks are more sure-footed. They routinely peek out from under Hoppy's belly and pop over to get something to eat. My kids took a moment before they went to school to say goodbye to the chicks and declared they have naming rights with Lemon and Lime topping the list. It's amazing how easy it is to have a hen raise her own chicks and to see the bond between mother and chicks! 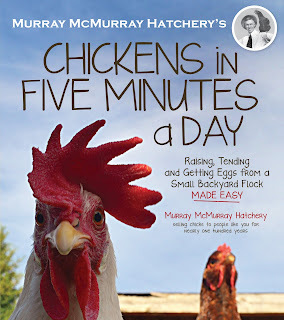 I think it's safe to say the folks at Murray McMurray Hatchery, one of the largest hatcheries in the United States, know a thing or two about how to raise chickens. They've been in the business of selling chicks for 95 years and have just transferred those years of knowledge to the backyard chicken owner in a new book; Chickens in Five Minutes a Day. I recently had a chance to preview this book and found it to be a wonderful resource; one that I'm glad to have added to my personal library. 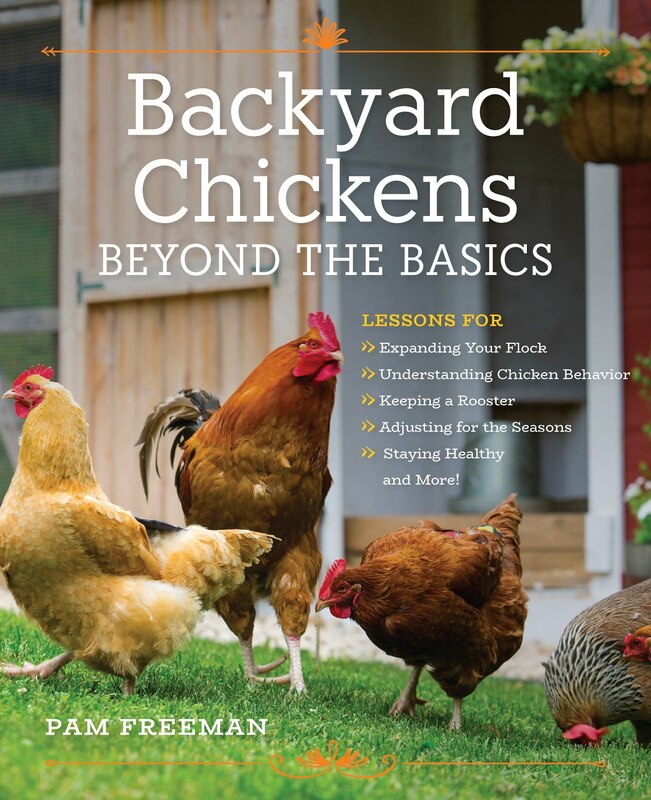 The premise of the book is that, providing your zoning laws will allow it, most everyone can easily have a flock of backyard chickens. 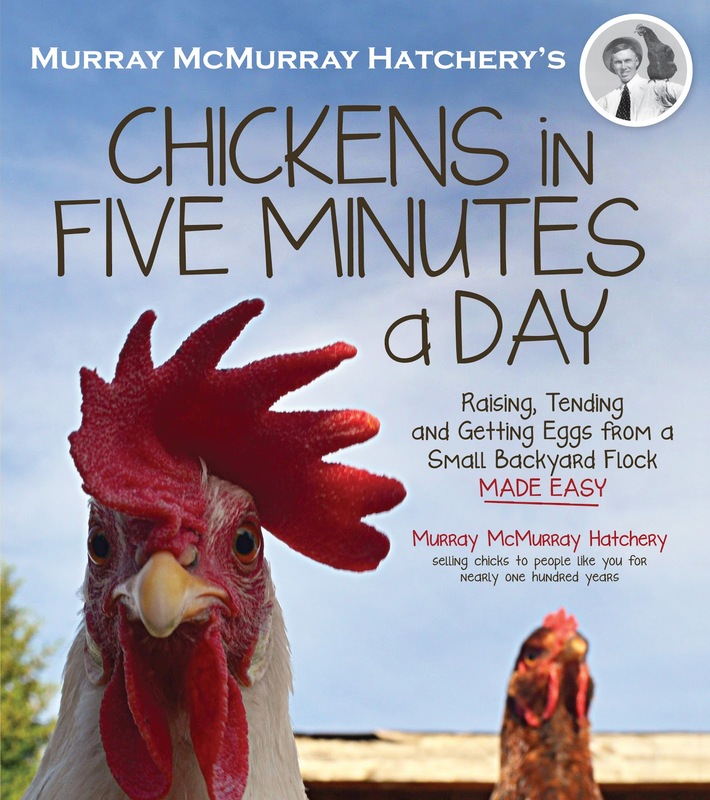 The book gives a well thought-out look at what raising chickens involves. It's comprehensive in covering everything from what to expect, to picking out breeds, setting up a coop, raising your chicks and day-to-day management of your flock. What I liked best was the emphasis on planning and how much easier, more efficient and rewarding this can make owning chickens. 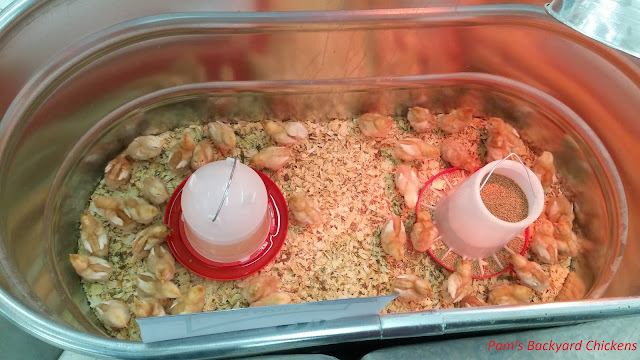 Personally, I think planning is something many folks miss in the rush of picking out cute chicks and beginning to raise them. I like how planning is laced into every facet of the book from picking out breeds to the best coop for your backyard and everything in between. With my own flock, planning what breeds to purchase has always been the fun part. And, if done correctly, really sets you up for success. Intentionally, my flocks are hardy and productive as well as beautiful. I like to try new breeds but always do my research ahead of time. However, I could have used this book when locating my first coop. We are not blessed with flat land here and poorly located our coop at the top of a small hill in our backyard. While it drains well, multiple walks up the hill each day have left us with an incline that won't grow grass and becomes dangerous in wet weather. Needless to say, we're putting up a new coop this spring! So, regardless of whether you're a novice or a veteran, there's something for everyone in this well-thought out book. I'm going to put some of this advice to work in my new coop and am looking forward to having more time to enjoy my chickens.